The rebuilt sidewalk in the 200 block of on Albany’s Second Avenue S.W. has an unusual dip. 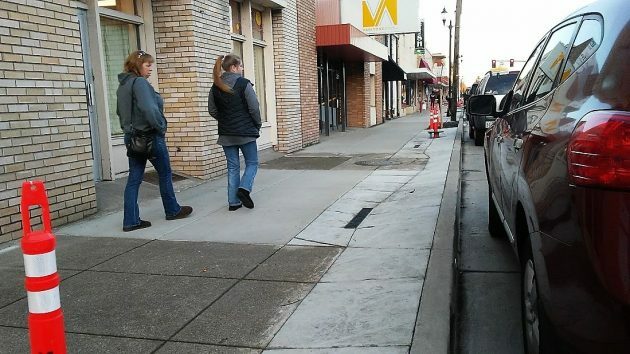 Monday was kind of a slow day, which may explain why I first noticed and then wondered about the shape of the new sidewalk on Second Avenue downtown. The walk was rebuilt as part of the city’s $8.5 million downtown streetscape project. What’s unusual about this section, in the 200 block just west of Ellsworth, is that from the curb toward the buildings, the pavement first dips down and then rises again in the form of a very shallow V.
It’s the result, I learned, of fixing old streets in the light of current rules and standards without rebuilding the whole thing from scratch. “We are working around existing conditions and following the Americans with Disabilities Act (ADA) regulations,” Lori Schumacher told me. She’s in the engineering section of Albany Public Works and helped design the streetscape project. To me looks like an accident waiting to happen…. There is absolutely NOTHING the city and contractors are doing for ADA. During this construction there is no way I could get my wheel chair in the downtown area. Even during the Veterans Day Parade where they put asphalt it was not set and the wheels sunk in deep. Wondering how the twice around is going to work. Big mess.